Starting the week with one of those outfits I've been wearing very often lately, I'm not leaving the house without some faux fur in winter. I bought this cute faux fur jacket in patchwork multi-colored details at H&M a couple of months ago when the winter collection started to drop. Back then it was a bit too warm for the unusual hot autumn weather, but now it's just right enough cozy. I combined it with a dark grey skinny jeans from Topshop (I can't live without my ripped jeans, even in winter..), some black platform boots by Vagabond and a burgundy velvet cut out top I got on sale at Urban Outfitters around 2 years ago. I really love the combination of colors I'm wearing in this outfit, to me black/white/grey/burgundy matches perfectly! For the accessories I went for golden/bronze tones and did some tribal necklace layering. Both necklaces are vintage and originally from Kuchi and banjara tribes. My favorite jewelry! Have a successful new week, lovers! Outfit: All that glitters is not gold. For the rest I decided to keep it a bit western inspired, but also simpler, so I added my double buckle belt, turquoise rings, a ethnic inspired coin necklace and some platform boots. ... How do you spend your weekend? The christmas markets have opened here in Germany and I'm already looking forward to visiting them and enjoying the start of the christmas time. Time flies so fast, 2015 is almost over and history! Outfit: Die to love another day, we rise again and lose our gravity. We rise again and lose our gravity..."
Outfit: Let's swim to the moon, let's climb through the tide. 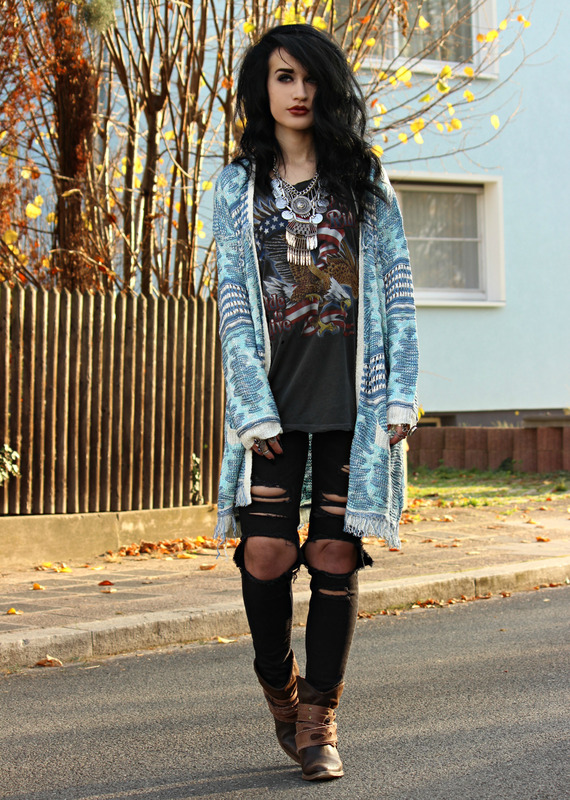 Starting the week with a laid back look including this cozy tribal cardigan with fringing details. I loved its colors and southwestern inspired design since the first time I saw it, it also got a great length. It's the perfect jacket to throw over when you're just hang around and are all lazy. You can never go wrong with a printed colorful cardigan when you keep the rest of the outfit darker and simple like I did here. I combined it with one of my beloved biker tees I bought secondhand a couple of years ago. I added some black ripped jeans to add some grunge vibes to the western inspired combination and my favorite western boots. Hope you all had a great weekend and an exciting new week. Outfit: Take the highway to the end of the night. Outfit: And in the end we start all over again.